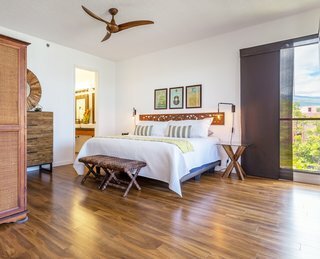 Clean and modern three bedroom, two bathroom beach home on Kahana Bay in West Maui. Gorgeous island-modern kitchen with flat slab Sapele wood cabinets and high-end appliances from Miele, Perlick, Bosch, and Thermador. With two king beds and two queen bedrooms in nearly 2000 square feet, up to eight guests can be comfortably accommodated. Thoughtful design touches throughout including antique Balinese headboards, handcrafted Mercury Mosaic tiles in a curbless shower for enhanced accessibility + beauty, and extra large, custom-crafted mahogany privacy doors make a statement in the living room while giving maximum privacy in the master bedroom. Year-round rentals available for much less than you'd think! Ask about our Premier Partner status and reviews on HomeAway.com. See more photos and book directly with no fees at www.homeescape.com/242... OR www.hawaiianhaven.com. uploaded Maui Modern, Budget-Luxury Remodeled Vacation Rental through Add A Home. Modern, accessible shower featuring Mercury Mosaics handmade tile. Old and new Hawai'i welcome guests in the entryway. Island modern kitchen with slab front Sapele wood cabinets and high-end appliances. Double queen guest bedroom with pops of coral and Hawai'ian decor. Single level floorplan with spaces to gather when you want and privacy when you don't. Custom-built mahogany doors make a statement in the living room & give maximum privacy. Custom vanity with vintage Hawai'ian mirrors bring together the old and the new. Master bedroom with antique Balinese headboard. Amazing ocean views direct from the condo living room and lanai.